Readers of the Malazan novels by Steven Erikson and Ian Cameron Esslemont will be aware that the novels range freely over a vast and complex world consisting of numerous continents and islands, not to mention other planes of reality. 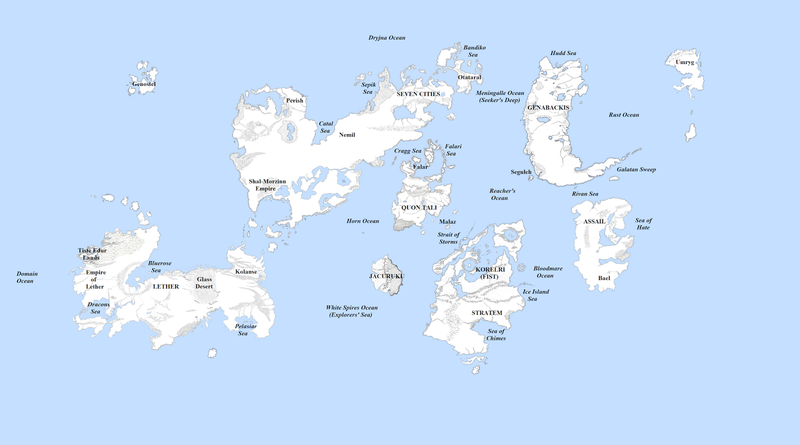 To date, the authors have resisted the creation of an authorised world map, but fans have been busy combining the maps from the novels to create the next best thing. This is the latest attempt, based on the excellent maps created by forum member D'rek at Malazanempire.com with some of my own minor changes. The entire south-western two-thirds of the Seven Cities continent is conjecture, although backed up by a detailed narrative description in The Bonehunters. The 'middle bit' of Lether and the south coast of the continent is conjecture, but heavily supported by a rough world map provided by Steven Erikson to the administrators of Malazanempire.com. The placement of the continent is also by word of Erikson, with its eastern coast being due south of western Seven Cities. The placement of Jacuruku is conjectural, but based on the directions on the maps. These show the Ocean/Strait of Storms as being located to Jacuruku's north-east. Also, Jacuruku is identified in Memories of Ice as being the "sister continent" of Korelri, and a god is able to stride from one continent to another which suggests a closer relationship. The Fall of the Crippled God also shattered north Korel, damaged Jacuruku and smashed the east coast of Lether, which works with this configuration. Finally, the White Spires Ocean (Explorer's Sea) is shown on the south coast of Jacuruku in the Blood and Bone maps, off the east coast of Kolanse in The Crippled God and is described as lying to the west of Stratem in Return of the Crimson Guard, pushing Jacuruku further north. It should be noted that Korelri/Fist is probably much too large on this map. The map in Stonewielder shows Malaz Isle being much larger in relation to the continent. This also supports the idea of Korelri being the sister continent of Jacuruku, which makes sense if Korelri is smaller and closer in size to it. Assail suggests that Stratem is still quite large, so it may make more sense to have Stratem as the main continental landmass and Korelri as its subcontinent. Assail is located due south of Genabackis as per the novel Assail, just a relatively short hop across the Galatan Sweep. The Bloodmare Ocean is located off Assail's south-western coast per the description in the novel, with the Reacher's Ocean located to the due west of the continent as per the map. The south coast of Assail is conjectural, but the descriptions of the continent in both Return of the Crimson Guard and Assail suggest that Bael (the lands south of the Black Sea and Blackstone Mountains) is a much smaller subcontinent of Assail on its south coast, so there probably isn't much more to what we see on the map. The following map shows the borders of the Malazan Empire in c. 1160 Burn's Sleep, around the time that Gardens of the Moon (and thus the whole series) begins. This maps shows the Empire in firm control of Quon Tali (its home continent), Seven Cities and territories it has seized in northern Genabackis, although these conquests are heavily disputed by the Free Cities, allied to the Crimson Guard and other mercenary companies. At this time Malazan armies are also located in Fist (the north-eastern-most island of the Korelri landmass), but are getting their backsides handed to them and contact has been lost for years, so I decided not to include that in the Empire's territory. What follows is a list of major geographical locations and what novels take place in those locations. For the upcoming books, Steven Erikson's Kharkanas Trilogy (set 300,000+ years before the main series) takes place in an unknown location which may or may not be part of the Malazan planet. The following Toblakai Trilogy will likely be partially set in northern Genabackis, but may range much more widely. Ian Esslemont's next novel, Dancer's Lament, kicks off a series of novels about the founding of the Malazan Empire and will likely be set on Malaz Isle and Quon Tali. Thanks for that. No matter how much I read, it still to much to take in. I assume that it's number 2, which would make sense in the context of Esslemont's books. Yeah, that's been noticed. It's impossible to set straight: Assail is definitely south of Genabackis and east of Korel/Quon Tali, which are equatorial continents, so Assail must be too. The only explanation is that a wizard - or in this case a Jaghut - did it. Looking at this map I wonder: Why so a long detour heading Kolanse, through West Lether, while it's located so nearl to Quon Taly in the opposite direction? DEEP SPACE NINE: To HD or Not HD?